The main side of the map measures 24" wide x 18" high. It features the entire metropolitan area, from the Santa Inez mountains in the north to the Pacific Ocean in the south; and from Montecito on the east to Isla Vista on the west. Dozens of illustrations highlight the points of interest. Enlarged detail from the area near downtown Santa Barbara. Enlaraged section of the separate map of downtown Santa Barbara. Enlarged section of the map of Solvang. 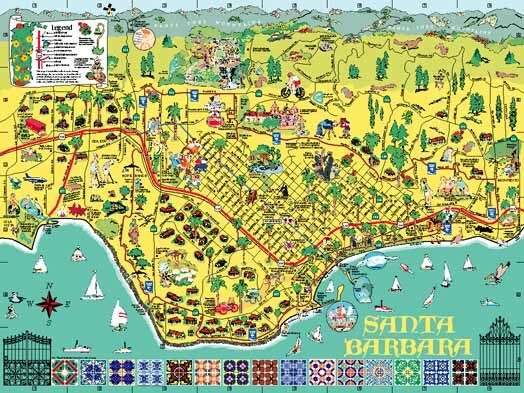 Click to go to the basic page describing the Santa Barbara Visitor's Map.